Who remembers the Fraggles? I was so in love with this show. Gobo is the "leader", level-headed and practical, and prefers to be in control of most situations. He plays the guitar (made from a gourd) and considers himself chiefly an explorer. Mokey is highly spiritual and artistic (she recites poetry), and is usually quiet and contemplative. She is the optimist of the group, trying to see the best in everyone and everything, and comforting her friends when no such "bright side" can be found. Red, in direct contrast to her best friend Mokey, is exuberant and athletic; she is one of the best swimmers among the Fraggles. She was described by Mo Rocca on VH1's I Love the 80s: Strikes Back as the "Buck the establishment Fraggle." She is also highly cynical of her friends' plans and ideas and often teases Gobo about his Uncle Travelling Matt (occasionally yawning while he reads the postcards). Red, like Gobo, also wants to be in control, and there is often friction between them over who should be the one in charge. Wembley, Gobo's best friend, is nervous and pathologically indecisive (this is mostly because he doesn't want to hurt anyone's feelings; saying 'yes' to someone means saying 'no' to someone else). In fact, "to wemble" is a Fraggle verb to describe indecisiveness. In later episodes of the series, Wembley works with the fire department, as their siren. The Fraggle Rock fire department, however, does not put out fires -- it starts them. Boober's cardinal trait is depression and worry, and his favourite activity is washing socks – Fraggles, however, do not seem to use footwear most of the time. Boober is almost always negative, and displays hypochondriac tendencies. 1. 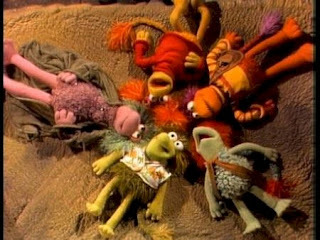 Which fraggle is your favorite? I always liked Wembley, which by the way is a great name. 2. Which fraggle are you most similar to? I must admit, Red is probably the most accurate. Mokey always got on my nerves. 3. Which fraggle are you most compatible with? I think I actually married a Dozer--not a fraggle, which suits me well. Go ahead, it's Friday. We could all use a little Fraggle on Friday!